Meet the cast and crew of the upcoming Center Theatre production of “A Wicked Christmas Carol,” written and directed by Bobby Keniston. 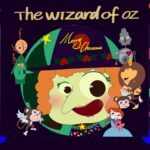 After the meet-and-greet, stay to play Wonderful World of Oz Trivia. Winners will take home tickets to see the show in December!